The Dund (Mid) Gobi Project consists of two exploration licences: 12929X and 15466X. The Project is located approximately 400km southwest of Ulaanbaatar and just over 200km west of the Mongolian railway grid and logistic route to China via the Erlianhaote border crossing. 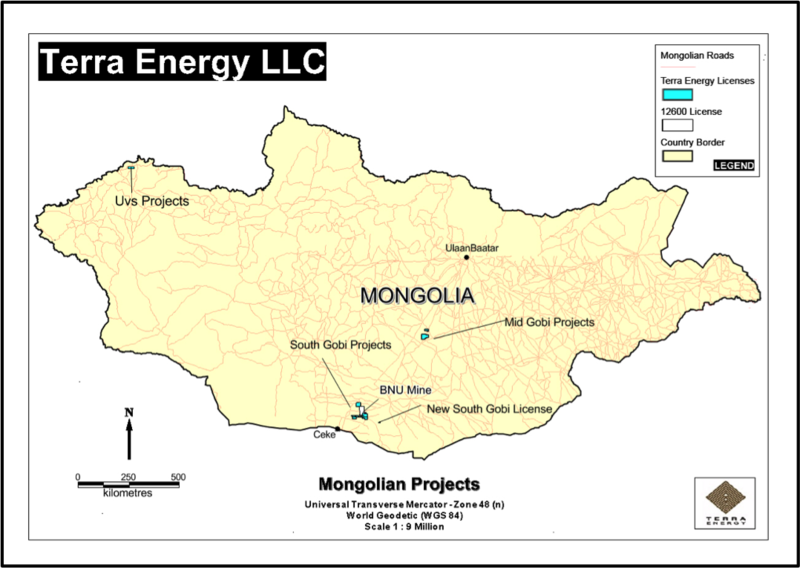 The two Mid Gobi Project exploration licenses are situated on approximately 36,000 hectares and are located in the coal bearing Ongi Gol Basin. While a range of mineral deposits exist in the area, the primary target is coal due to the regional geology. The mineralization consists mostly of moderately dipping sedimentary basins that potentially provide multiple hard and low rank surface coal targets. The Project’s location is relatively close to infrastructure, including Mongolian and Chinese electricity generators. 15466X is an exploration license with a renewable term until 13 November 2016. Exploration on the license commenced in 2011 and the plan was to drill a series of open hole lines in a North – South direction to intersect the East – West stratigraphy and ultimately confirm coal sequences and thicknesses. The program in 2011 consisted of six holes with an average depth of 200 meter for a total of 1148 meters drilled. These holes were drilled in the coal bearing Cretaceous Tevshiin Gobi formation in the central part of the license. No coal was intersected. Ground based magnetic geophysical studies were also completed in 2011 on over 8000 square meters of the license. One hole was drilled targeting the Tsagaan Ovoo coalmine seam, which the license surrounds on three sides. The small program of one hole was attempting to intersect the same coal resource along strike. 12929X is an exploration license with a renewable term until 13 November 2016. Exploration on the license commenced in 2011 and the strategy is to drill a series of open stratigraphic holes across the tenements to confirm sequences and coal thicknesses. Following prospective coal intersections across six holes, which were used as Points of Observation, MDM completed a JORC inferred and indicated resource report in December 2011. The Inferred Resource of 189.1 million tonnes and an Indicated Resource of 32.3 million tonnes were reported, along with an exploration target of 165.9 million tonnes to 829.4 million tonnes. Coal quality is available for these six-cored holes with the results showing a medium to high ash thermal product across three seams of potential economic thickness. Limited coking tests have been completed but historically, the target coal within the Jurassic Shahan Ovoo formation, is not known for its coking properties. In 2012, fluorite mineralization was discovered outcropping on the license, see map below for location. Preliminary grab results have determined a high-grade fluorite outcrop rated as Ceramic Grade. A magnetic survey has been completed by Logantek LLC and preliminary magnetic (TMI) results are shown. The image shows a magnetic feature in close proximity to the area of outcrop and sampling with an orientation approximately North East to South West. Exploration in 2012 targeted the extension of the resource to the East and West. 16 holes with a total of 3000m open and cored were drilled, with one hole intersecting coal. This was documented as inferior coal however, due to poor quality data and issues associated with the quality of geophysical logs the presence of further coal intersections cannot be conclusively proven. An Independent memorandum following exploration in 2012 by MDM states: “In their current state, the geophysical logs cannot be used for accurate identification of coal seams and depth corrections”. Exploration in 2013 consisted of another four open holes within the resource area. Two of these intersected coal: one had a substantial coal intersection of 9 meters at economic depth of three meters.